Frazer has far-ranging experience in the specialized accounting methods for the construction and engineering industries. From tax and accounting compliance and consulting on purchase and sale of real estate, negotiating and tax free exchanges to cost segregation and business valuation, our team of experts can provide you with expert tax, financial, and management advice in any stage of your construction business. 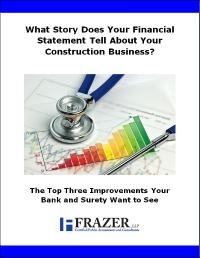 Whether helping you manage operating costs or processes, analyzing company or project financial performance – or knowing how best to work with bonding agencies and banks – the Frazer Construction and Engineering Team is ready to guide you through the day-to-day management of your business. Beyond pure tax and accounting matters, there are strategic considerations unique to the construction and engineering industries. Our team’s experience can add great value to your business by helping you identify your options and opportunities – and then help guide you to achieve the best outcomes. If your primary focus is construction or engineering, contact Frazer’s Construction and Engineering Team. Frazer LLP: With You. For You. The Frazer 411 on Construction and Engineering is Frazer, LLP’s monthly enewsletter, including articles on a variety of topics to help you manage your business. View the archive and subscribe to receive future issues. When you have questions don’t hesitate to contact us.